We have just released support for NXP ARM9 LPC29xx family of microcontrollers. We do not have a Windows 7 PC which has a parallel port and so we have never been able to try a ColdFire parallel port BDM interface on this operating system. It was clear that parallel port debugging on the 64-bit version of Windows 7 was not going to be possible because our parallel port driver is a kernel driver and is not signed. As such, Windows 7 64-bit edition will not allow it to be installed under any circumstances. Now we have information from one of our ColdFire customers who has recently migrated our ColdFire Suite to new PCs that use Windows 7 32-bit edition. They report that parallel port debugging with our ColdFire Suite and the P&E Micro parallel port BDM interface works successfully. The STM32 Development Suite is the first package to incorporate jState and a new evaluation version is available: STM32 Development Suite Download. We have added additional options to our on-line shop. Firstly it is now possible to select Royal Mail Airmail as a carrier option for international shipments. This delivery option takes longer (sometimes a lot longer - more than 4 weeks for Mexico!) but offers a cost saving over our traditional Fedex International Priority shipment method. Secondly, we have added PayPal as a payment option so you can purchase items using your PayPal account. Initially, payments will be processed in pounds sterling. We will implement additional currencies when we become more familiar with the PayPal system. We have recently been asked how to put the /Op option on the command line of the Crossware 8051 C Compiler when building from within the Embedded Development Studio IDE. We do not recommend that the /Op option is applied from the command line. It can lead to unpredictable results and applying it across a whole module or a whole project can potentially lead to hard to track down faults. Instead we recommend that it is applied to specific functions using the optimize pragma. In this example, only the expressions in the function func() will have integral promotion suppressed. The Crossware web and mail servers went offline on Friday due to a failure of our Internet connection. We relocated the servers when it was clear that the issue would take some time to solve and the servers were operational in their new location by Monday afternoon. The Internet connection fault is now fixed and everything should now be back to normal. Our STM32 Development Suite is proving to be very popular and to help new users get started we have prepared a brief tutorial. How to see the output from the ARM LPC2103? A question we have just been asked is "How to see the output of the ARM LPC2103 on Crossware?". We will assume that the user is interested in outputting messages from the excecuting ARM chip. Here is a simple method of doing that. Create a new project selecting the NXP LPC2103 as the target chip, accepting all defaults offered by the New Project Wizard. Run the program in the simulator and the Hello world message will appear in the Debug view. Run the program on the hardware using the Jaguar USB debugger interface and the Hello world message will also appear in the Debug view. The ARM7 debug communication channel (DCC) is being used to route the message to the Debug view. A special putch() routine in the library sends the output to the DCC. When you add printf() to your program, putch() is required as the output function. If you do not include your own version of putch() in your program then this special library version will be automatically included. When debugging with Jaguar, Jaguar captures the output from the DCC and the debugger writes it to the Debug view. 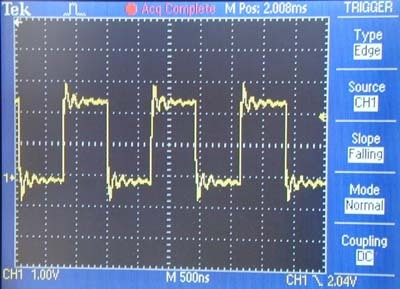 When simulating, the DCC is simulated and so the output is captured and written to the debug view in a similar way. In the previous post we described a method of outputting a fixed bit pattern to a port pin. The method we used will work on all ARM chips - ARM7, ARM9 and Cortex-M3. The result was a single write instruction for each output bit. In this post we will use the bit-banding of the Cortex-M3 core to achieve a fast output of a variable bit stream. 2. on-chip peripheral space starting at address 0X40000000. To read or write a single bit in the on-chip SRAM space we write into the bit-banded region starting at 0X22000000. To read or write a single bit in the on-chip peripheral space we write into the bit-banded region starting at 0X42000000. Copyright © 2011 Crossware Products. All rights reserved.